One of the most-often-asked questions we've received from long-time fans is 'Where's Pedro? Is he in TAGAP 3?'. Well, here's your answer! 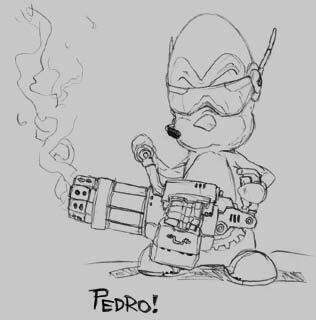 For those who haven't played previous TAGAP titles, Pedro is a cybernetic combat penguin from the same clone batch as the series hero, Pablo. The difference between the two is that where Pablo was too independent to be brainwashed, Pedro remained loyal to his creator, the insane Dr. Glowenko. However, after Pablo defeated Glowenko and saved Pedro from a certain death, Pedro decided correct his ways. Now he and Pablo fight together against evil villains hell-bent on conquering the world. 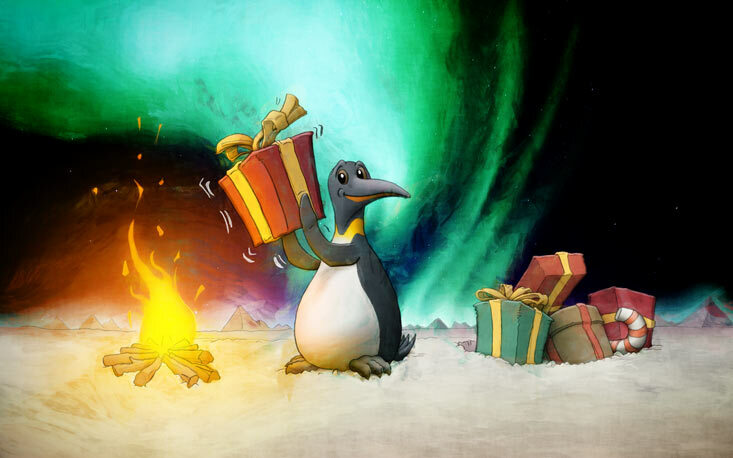 In TAGAP 3 the heroes have been forced to part ways, as Pablo has been abducted by Pluto's penguins. But when Pedro re-joins Pablo in the fight, he comes in miniguns blazing – even in single player. Yes, theres a whole section where Pablo is joined by AI driven Pedro! The reason why we haven't revealed Pedro's role until now is simple; We weren't 100% certain how big of role he would play. I wrote him in as a crucial part of the story from the start, but we weren't sure if he would be a proper NPC with AI, a support character like in TAGAP2, or just as a character in the cut-scenes. We naturally always aimed for the AI NPC option, but since this was completely new ground for us to cover, we wanted to make sure we could actually do it before announcing anything. As for the design, Pedro has remained pretty much his old, grumpy self. Of course, thanks to the HD resolution of TAGAP 3 and the skeletal animation system in play, he had to be completely re-drawn with plenty of new details added in. Also, with multitexture and shader effects in play, his sunglass visor has a new reflective sheen as well. And his minigun was fun to redesign, too; It had to fit into the general design of the game, but also look like it came from a completely different arsenal of weapons. After all, it's not from Pluto, but is terrestrial in origin. Thanks to a certain big movie that came out recently, space battles are all the rage right now. So, here is another glimpse of the low-gravity space combat in TAGAP 3! 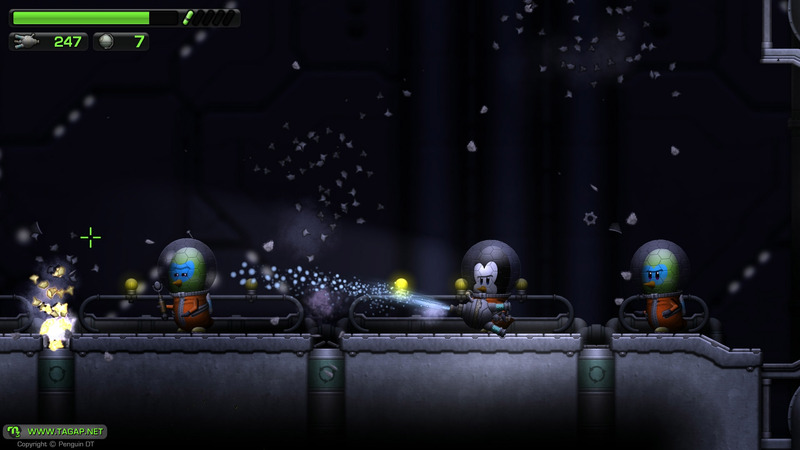 The low gravity affects everything, including the nitrogen gel spewing from Pablo's Cryogun seen here. In this shot Pablo is dodging not only space-suited funky penguins, but also the automated trash chutes ejecting junk into the void of space. And what would a blog update from our dungeons be without the usual update? I'm actually crafting the 'game over' screen. Yeah, I confess, I had completely forgotten about this. In fact, if it weren't for Petja loosing all his lives while messing with background details during test session – and crashing the game by doing so – I likely wouldn't have remembered to do this now. Embarrassing, isn't it? Anyway, this is again a retro-styled 'Continue / Quit' screen with a fun little cinematic, only this time I've decided to build it in a completely different way, allowing me to use more complex animations with more addition to detail. The problem is I can't 'hack' my way around the way your choices in the menus are applied – so I had to rewrite a big chunk of how the sequences are handled. It's not as bad as it sounds; This is actually the last chunk of the cut-scene code I haven't redone for TAGAP 3 yet, so I might as well. If nothing else, this will at least result in a much more streamlined and straightforward codebase.